"Spiritually Speaking" by Rev. Carla Golden: Glenda Watson Hyatt--"I'll Do It Myself"
Glenda Watson Hyatt--"I'll Do It Myself"
Glenda is one of my heroes. She wrote her book on the computer, typing with her left thumb. You see, Glenda has cerebral palsy due to a lack of oxygen at her birth. But this woman is a go-getter and someone I wanted to share with you. Carla: Glenda, what are your spiritual beliefs and how have they supported you? Glenda: I believe in a loving God who provides what I need when I need it, which isn't necessarily when I want it. I also believe He helps those who help themselves. I have always tried to do my best, to try things on my own and to keep moving forward. Knowing that God will provide what I need and will guide me provides comfort and strength and eases my worries. My beliefs enable me to be a positive and content person despite the challenges and difficulties I face. Carla: When you're feeling discouraged, who has been an inspiration to you? Glenda: I've been inspired by Oprah's messages of live your life with passion and purpose. Dr. Robert Schuller from the Crystal Cathedral has inspired me with his possibility thinking and his "if you can dream it, you can achieve it" attitude. How people treat me and systemic barriers are what discourage me the most. In those times, I think about what others have gone through; for example, my grandma, with bone cancer, who crawled up and down the basement stairs to do the laundry herself. I then listen to that little voice inside, or perhaps it is God whispering, and I realize that I have come too far and have too much to offer to allow someone or something to stop me. I dry my eyes, take a deep breath and keep going. Carla: What have you learned from having cerebral palsy? Glenda: It has taught me perseverance, patience, to be a creative problem solver, to be more accepting of differences in other people (to look beyond the exterior package and to see the individual inside), and to prioritize and focus on my top priorities--since cp limits my energy. Carla: What accomplishments are you most proud of? Glenda: I am proud of: graduating from a regular high school, earning my Bachelor of Arts, getting married, buying our first home. 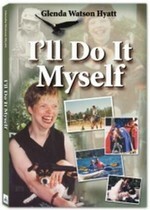 However, the accomplishment that I am most proud of is writing and self-publishing my autobiography I'll Do It Myself, which has been my dream since I was ten. Over the past thirty years, I have dreamt, read, researched, planned and prepared for this moment. Despite a few a bumps and detours along the way, I did it! When I opened the first box in December and saw my book for the first time, it was an emotional, "fall on my knees" moment!